In the years immediately before World War I, Leopold Guttman’s business continued to expand. He added the installation of gas, water, sanitary, and electrical installations to services the company offered. In addition to the factory and warehouse in Vienna, there were branch warehouses in major cities of the Empire—Budapest, Lemberg (present-day Lwov), Bucharest and Prague. With his six children–two boys and four girls born between 1876 and 1891–now fully grown, Leopold’s wife Anna joined the firm and helped manage the growing enterprise. Austria was a very different country after the war. Vienna was now the capital of a small alpine republic battered by epidemics, food shortages, inflation and unemployment. And yet it became the first European city to elect a social democratic government and launch a program of reform benefiting the working class. In response to an acute housing shortage, the municipality embarked on a campaign of social housing that culminated in the construction of 64,000 new apartments. Specializing as it did in domestic installations, the firm of Leopold Guttmann was in a good position to take advantage of these new developments. By 1924, Leopold had done so well, he was able to acquire the ultimate symbol of financial success—a house in Bad Ischl,the popular resort town in the Salzburg region where the Emperor had summered before the war. Leopold’s purchase—a spacious three-story stuccoed structure, fronted by wooden balconies with espaliered fruit trees–was known as the Villa Traun after the local river. The house was made up of several apartments so that all six Guttmann children and their families could enjoy independent quarters during the summer holidays. The fairy-tale quality of the building with its fanciful timbered roof boasting an onion dome, a miniature steeple and overhanging gables was enhanced by the small-gauge railway that ran so close to the garden, the engineer regularly waved to the inhabitants. This was the fabled “Salzkammergut Lokalbahn,” built under the patronage of the Emperor in the 1890s. A local artist had been called upon to map the route so that the little train would pass the most picturesque spots between Ischl and Salzburg. Villa Traun with family members on the lawn. After the end of the monarchy, Bad Ischl became the headquarters for producers of imperial nostalgia—the composers and librettists of the so-called silver age of operetta. Franz Lehár of “Merry Widow” fame had his villa there and the others came as summer guests, composing and writing in rented villas and hotels. They would meet over “Viennese breakfast” (coffee, fresh rolls, marmalade and a soft boiled egg) at the Café Zauner on the Esplanade or gather in the late afternoon in its smoking room, often consulting with visiting singers and actors. Most of them were Jewish and their extraordinary success, which extended to London’s West End, Broadway, and eventually Hollywood, insulated them from the growing anti- Semitism in some of the other resorts in the Salzburg region. In 1921, Arnold Schoenberg had to interrupt his vacation in nearby Mattsee because of the local hostility to Jewish summer guests. 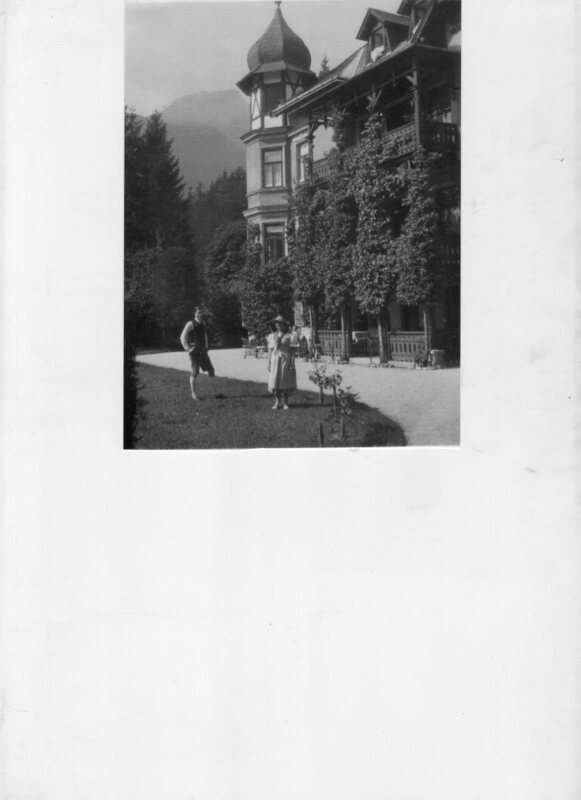 Great-grandfather Leopold Guttman made the most of his days in Bad Ischl. In the picture heading this blog he and his wife are seen in one of those fake wooden airplanes in which one could sit and be photographed on the Esplanade. He was so pleased with the result that he sent it as a postcard to his eldest son in 1925 with a message from “the higher regions.” He died three years later, leaving his two sons the business he had founded, and his daughters the Villa Traun. A lovely peace, dear Monica! My father was also fond of Ischl and so were Styra, Simon, Sumathi and Dashiell when I took them to the Cafe Zauner a couple of years ago!